TMotion is a self-contained 3D input device that enables spatial interactions around a mobile device using an enhanced magnetic-sensing technique. 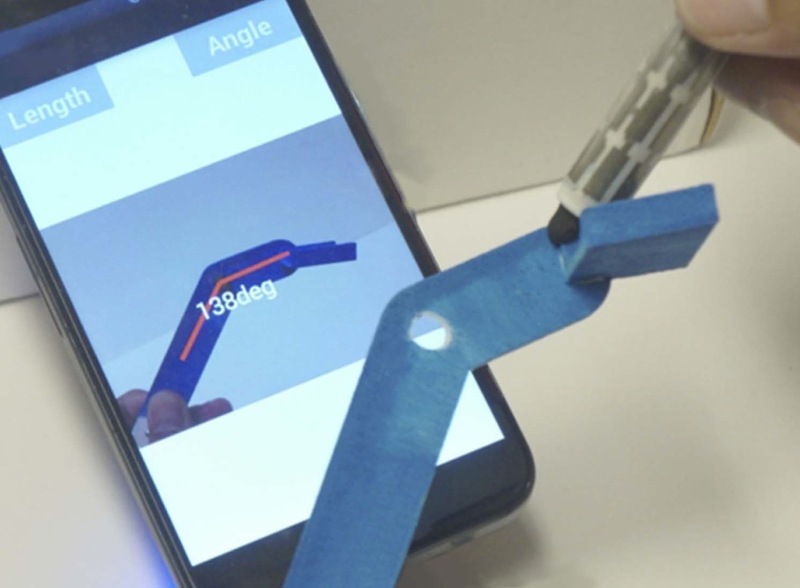 Moving the stylus around the mobile device produces continuous 3D position tracking data in real time. Example applications that highlight TMotion's interaction capabilities include spatial tangible measurement, mid-air menu control, and mobile AR input. As 3D mobile interfaces develop, there is an increasing need for better methods to handle and exploit richer user inputs. We envision that a real-time 3D mobile input device like TMotion will fulfill these requirements. Yoon, S-H. Huo, K., and Ramani, K. TMotion: Embedded 3D mobile input using magnetic sensing technique. Proc. of the 10th International Conference on Tangible, Embedded, and Embodied Interaction ACM, New York, 2016, 21–29.